V Ravichandran, a third generation farmer from Nannilam in Tiruvavur district of Tamil Nadu, says he is going to stop growing sugarcane in his fields. “I am switching over to pulses now,” he says, pointing out that legumes overcome the cash crop’s problems, including high water consumption. It helps that the government has raised the minimum support price forlentils. 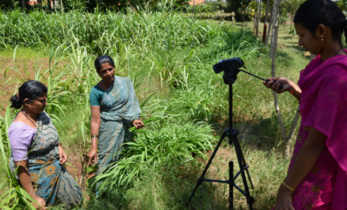 Ravichandran is just one among many farmers who are turning to smart crops, focussing on pulses, coarse cereals, vegetables and fruits that are climate smart. The need is pressing as over 70 per cent of India’s poor live in rural areas and 52 per cent of them are in agriculture. Successive droughts have led to a scarcity of water and crops have failed. Forced to borrow, farmers are now in a terrible debt trap. As global warming sets in, projections are that agricultural production worldwide will fall by 2 per cent per decade, even as food demand rises by 14 per cent each decade. Global bodies are also pushing climate smart farming in a bid to reduce agriculture’s carbon footprint. According to the Consultative Group on International Agriculture Research (CGIAR), a global consultancy, one third of all human-caused-greenhouse gas emissions comes from our food system. 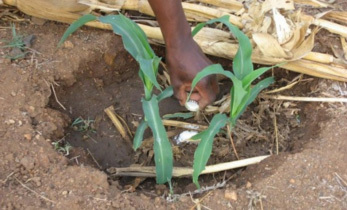 The solution is to go for climate resilient crops, diversifying the crop mix, using technology to reduce water use, enhance soil and cutting down on fertilizer use. Some of these solutions are now coming from Indian Council of Agricultural Research (ICAR)’s project NICRA (National Innovations on Climate Resilient Agriculture) set up in 2011. As part of this project a host of model, climate smart villages are being created across the country supervised by the Krishi Vigyan Kendras (KVK). It’s an ambitious project but the fruits of labour have been sweet, says Pradeep Pagaria, Programme Coordinator of KVK at Barmer in Rajasthan, a dry land that is now flowering. Pomegranate orchards and medicinal plants are now being grown by the villagers in addition to the traditional bajra , guarphaland castor oil plant. Says Pagaria: “We have done four things – natural resource management, diversifying crops, building ecosystem and setting up VCRMs – village climate risk management committees.” States like Haryana, Punjab, Bihar are also piloting climate smart villages, some of them assisted by the CGIAR. 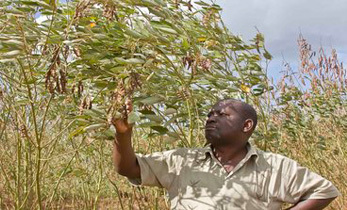 But others, besides the government, have been also working on climate smart crops. Medak, which has the highest number of farm suicides in Telangana, is a story of contrasts. Even as farmers who have stuck to input-intensive crops such as sugarcane, cotton and paddy are in deep distress, one particular belt has survived the famine. This belt grows millet. 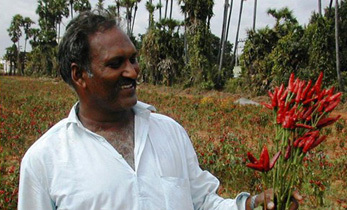 Twenty years ago, the founder of the Millet Network of India (MINI), P V Satheesh set up the Deccan Development Society (DDS) and started an experiment with millets. 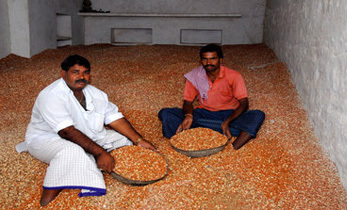 DDS introduced hardy millet varieties in 75 villages in the area through a collective. “Water-guzzling wheat and paddy will face tough challenges as temperatures increase. Millets are the way forward for countries like India where food security and nutrient security are a major challenge,” says Satheesh. “Growing crops with drought and heat tolerance is one method to adapt to the vagaries in climate. 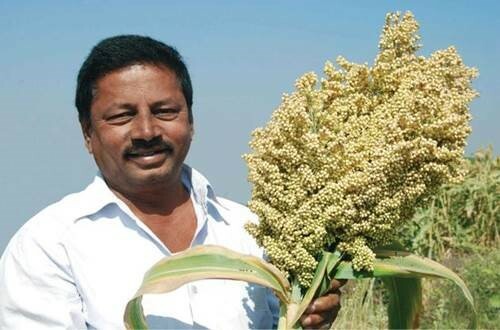 Millets are good candidates,” says B Dayakar Rao, Principal Scientist at Indian Institute of Millets Research (IIMR). Today MINI is a pan India alliance of over 65 institutions that promote different varieties of millet such as foxtail, kodo, pear millet and finger millet – ancient grains that had lost out to cotton and maize. Over 50,000 farmers are part of the alliance that has spread its activity to Uttaranchal, Nagaland, Odisha. A host of other organisations such as Canada’s International Food Security Research Fund and the International Development Research Centre, which runs Project Dhan in Tamil Nadu and Karnataka, are promoting millet farming too. Professor M S Swaminathan’s Foundation too has been working on millets for nearly two decades trying to preserve the germplasm. He rues that with wheat, rice, corn, soyabean and potato becoming important, India’s food basket had shrunk with many of our old cereals – or coarse cereals – becoming near extinct. Now, as the health and environment benefits of these cereals percolate down, a revival of sorts is taking place. Other crop experiments are also on. For instance agriculture scientists at the International Rice Research Institute (IRRI) are trying to create climate smart varieties of rice. Sahbhagi Dhan , a rice variety, is being tested in Odisha and Jharkhand. Drought resistant strains of maize too are getting into the fields. But resource scarcity expert Indira Khurana, who is with global consultancy IPE says crops are only part of the story. “What is required is a package of agricultural practices that will withstand the pressures of climate change.” She explains these include a mix of biodiversity, technology and conservation. “Another important factor is to take care of marketing of this produce. Unless there are markets available these will not be cultivated by farmers,” says Khurana. Significantly, bodies like ICRISAT, are intervening (see story on Smart Foods) and companies have started putting these smart grains on supermarket shelves. Prem Singh, a farmer activist in Badokar Khurd, a village in Bundelkhand’s Banda district, shows that agriculture can be a sustainable. While people around him are reeling with drought, his patch is green. The farmer who practices organic cultivation believes it is because of his periodic proportionate farming method, which involves crop rotation and seed development. 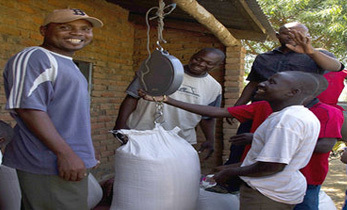 Instead of government seeds that guzzle water and urea, he chose traditional, local seeds. “Mono cropping is bad news. One-third of your land should be fruit trees and vegetables, one third pulses and grains, one third animal husbandry,” he says, pointing out the concept of rainbow revolution, an integral development programme of agriculture. These might be scattered efforts, but the seed of a new farming movement has been sown.